As soon as the crew arrived this morning it was time to turn the classroom into a working studio once more. Table and chairs were put away, paint was put back on the shelf and tools were returned to the cabinet. The shop was swept out from wall to wall and then a bunch of features were pushed back in for paint. The first piece to be finished was the Gruffle Tiki DUG which we sculpted as a demonstration piece at the first workshop. It's hard to believe this tiki is sculpted from concrete. Out in the parking lot the ship poop deck was lifted into place for the start of the sculpted concrete work. The bottom portion of the mast tops were also put in place. 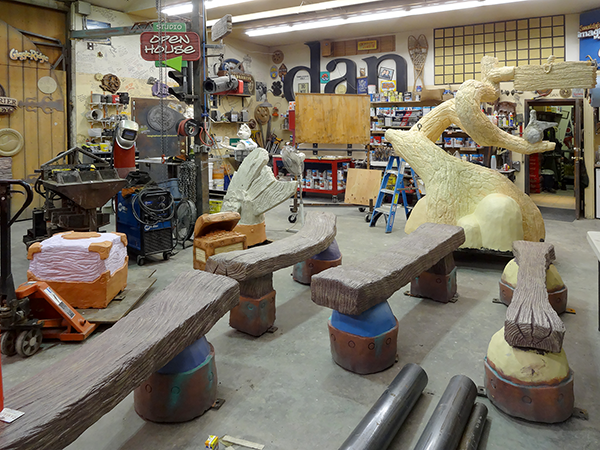 These pieces will get a little concrete to match up to the feature below and then be lifted off for finishing. Phil kindly posed for me to put some scale into the feature. This ship is a good size! Phil looks ready to set sail for Trinidad. It was a great first day back at work. Small sculptures are fun too!